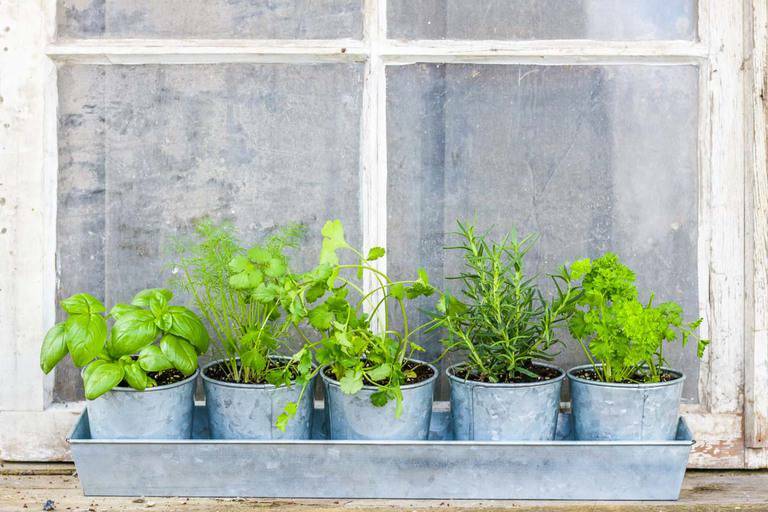 Planting a window herb garden is easy, follow these simple steps to make sure your herbs thrive and grow! Nothing is better than fresh herbs on a home-cooked meal, and growing your own is something everyone can do. A window herb garden is one of my favorite ways to bring life into a room. 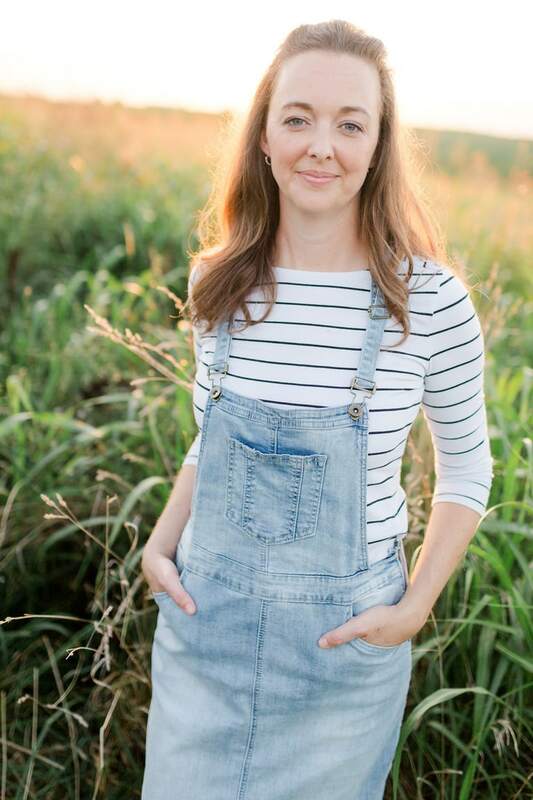 I love pretty decor but I love it even more when it’s functional – herbs fit that bill! I get asked frequently what a beginning gardener should plant and I always recommend starting with a window herb garden. 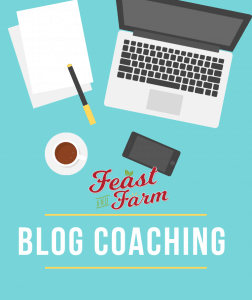 It’s a project that is easy to tackle and one you can use in your cooking right away. 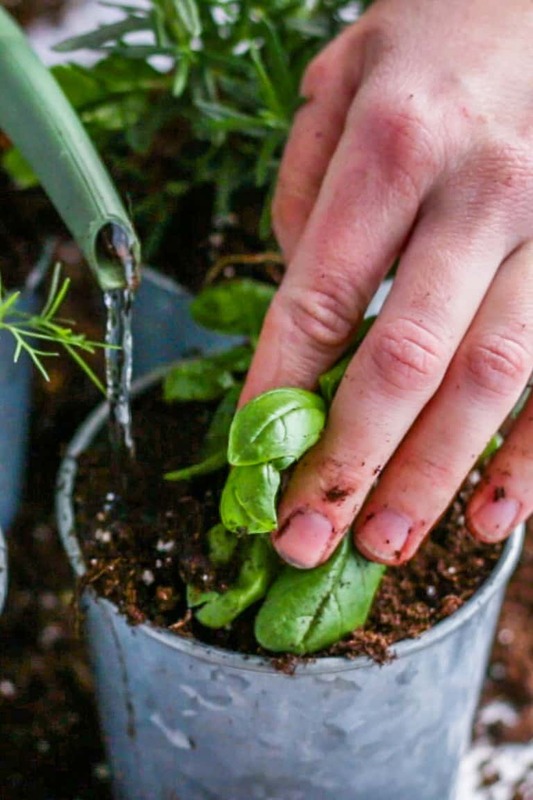 In this post I’ll show you exactly how to plant a window herb garden! Choose herbs from the store that you know you’ll use in the kitchen. 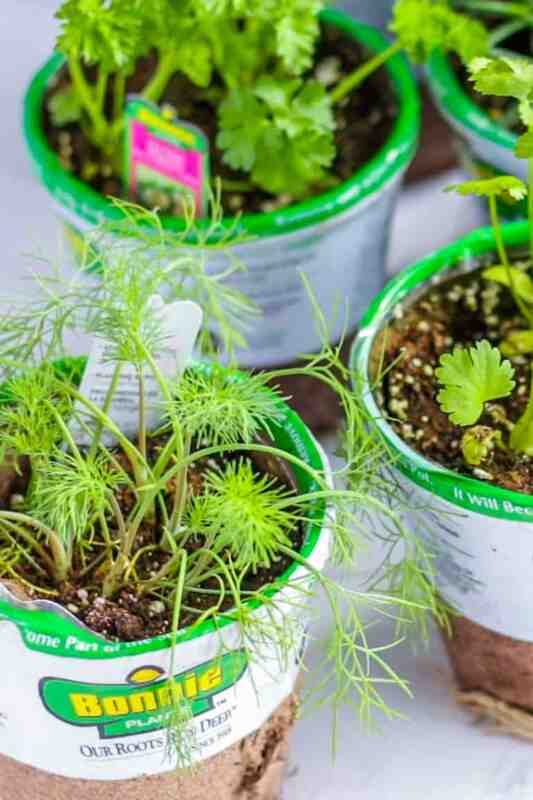 They might look a little sad, like this dill plant here, but just give them a drink when you get home and they will be alright to wait for a few days until you’re ready to plant them up. 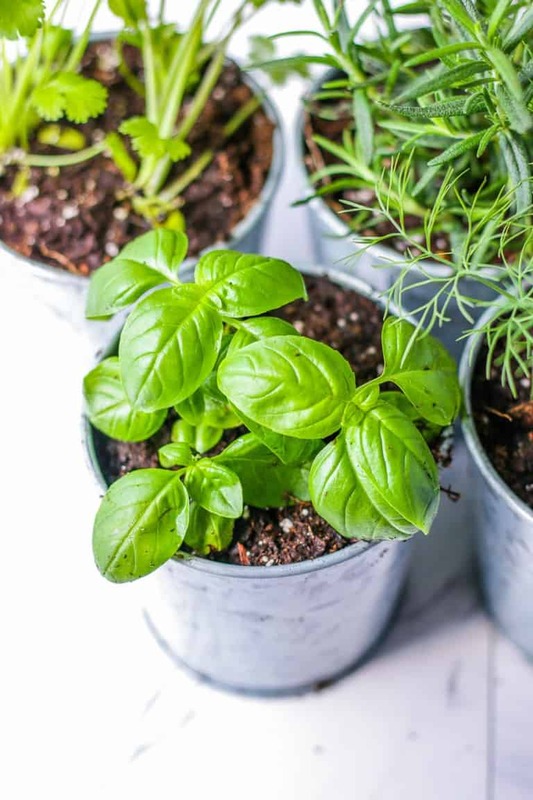 The planting containers you use for your window herb garden need to be big enough for your plants and give them a little bit of room to grow. Herbs actually do alright in smaller containers, so don’t stress too much about container size. Your herb garden containers must have good drainage, this is really important for making sure the plant roots aren’t sitting in water. Overwatering is unhealthy for plants, and most herbs really don’t do well in overly wet conditions. The drainage holes in the containers I used in these pictures are about the size of a nickel. I love that these containers come in a tray so the excess water is caught and doesn’t spill over! That is another good thing to look for when picking containers for your window herb garden. This cute set is from Gardener’s Supply and I’ve loved it so far! Prepare the containers for your window herb garden by adding a quality potting soil to the bottom. A quality potting soil doesn’t need to be organic or anything fancy. I always use a moisture controlled potting soil for indoor plants because it lessens how much you have to water at one time. That is important because it helps eliminate annoying pests like tiny fungus gnats who thrive on soggy soil. I water the soil a little bit in my containers and make sure it’s evenly moist before placing the plant. Much of the time, herbs will come in these plantable growing containers. While these are fine to plant in the garden, they don’t fit well or look good inside a small indoor window garden container. I remove them by simply cutting down the side. Try not to slice through too many roots when you do this. 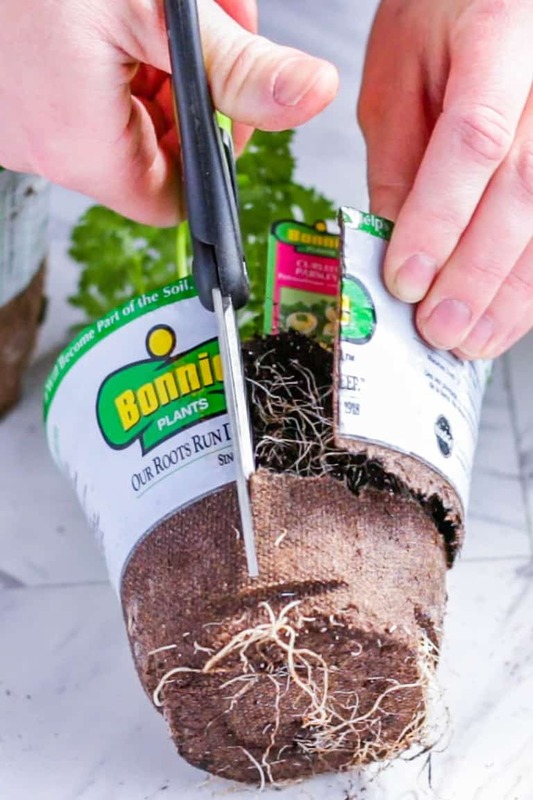 You’ll want the root ends to be loose, they can get compacted in the store pots. The plants will bounce back from transplanting shock much faster if their roots are already in the new soil. 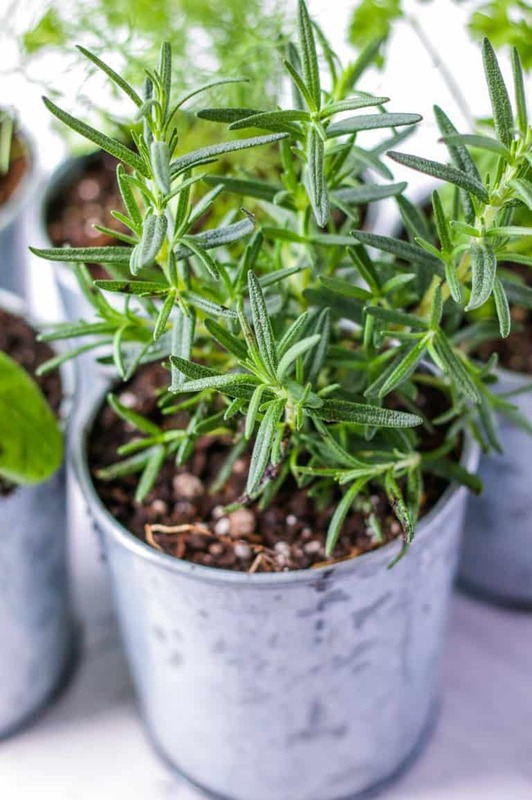 Once the plants for your window herb garden are in their pots, tuck the soil down around them and then press them lightly in on top. Don’t use too much pressure here, they still need room to work inside of their containers. 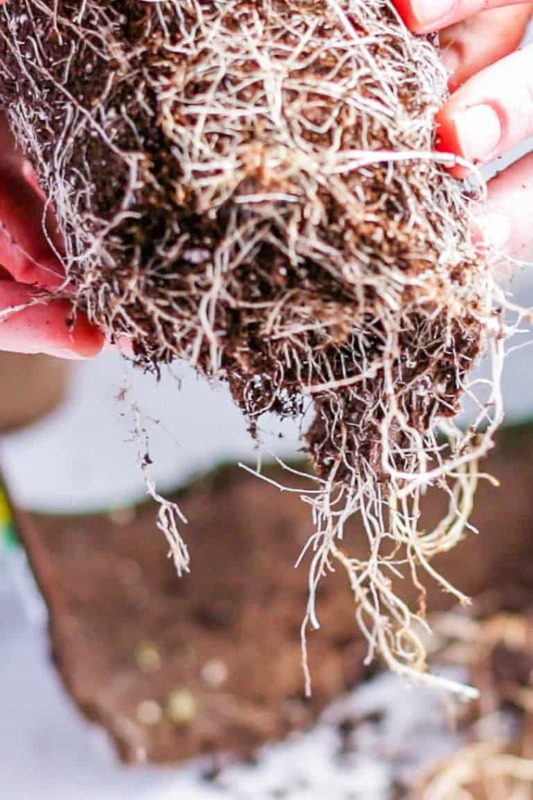 Overly compacted soil makes it hard for the roots to do their job and continue to grow. The last step is to water them in! 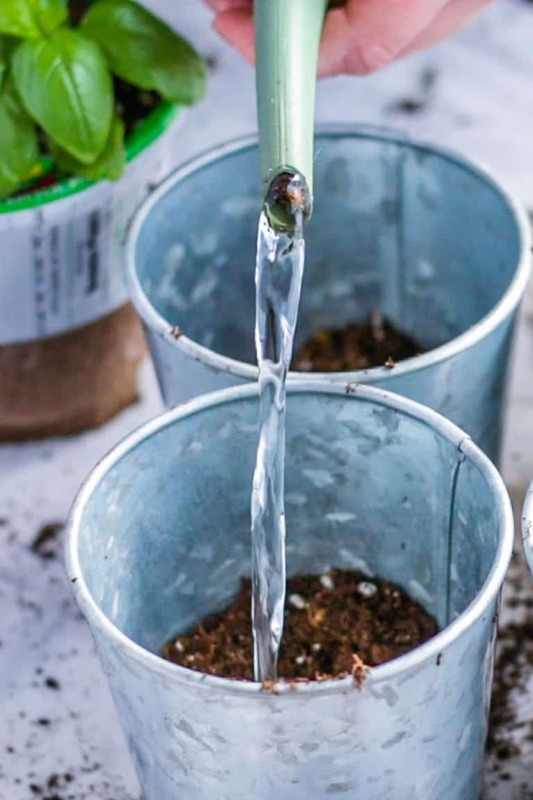 Watering immediately after planting helps reduce transplant shock. 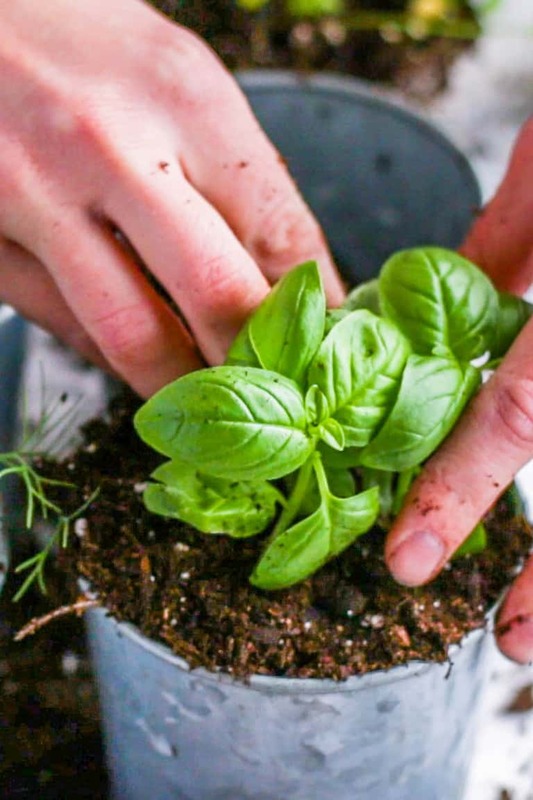 Your window herb garden should be growing in no time! I noticed new growth on this one a couple of days after I planted it. I can’t wait to use these fresh herbs in some homemade meals! Basil is one of my favorite herbs to cook with. Fresh basil is always amazing in dishes like Rachel’s Zucchini Lasagna Roll Ups! Of course, basil pairs well with pasta but basil makes almost any dish taste fresh and flavorful. Don’t be afraid to experiment! Rosemary is another one of my favorite herbs! It goes well with other strong flavors, so it’s amazing in my Homemade Focaccia Recipe and Rachel’s Chicken with Garlic Mushroom Cream Sauce. I love having rosemary in my window herb garden. It’s incredibly fragrant and makes the kitchen smell like heaven! I hope you feel confident enough to plant your own window herb garden now! 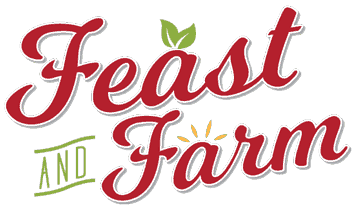 If you need pointers on how to harvest and preserve the fresh herbs you are growing head over to my post, Herb Harvest and Preservation. It gives step by step instructions on how to harvest a variety of herbs and how to store them so you never let them go to waste.